Betty L. Flinders, 79, of Fostoria, passed away at 4:15 am Sunday November 4, 2018 at Good Shepherd Home, Fostoria. She was born November 16, 1938 in Quincy, KY to the late William and Amanda Kathryne (Trailer) Jordan. She married Harry Flinders Jr. in Vanceburg, KY and he died January 1, 1991. Surviving are four children, C. Wayne Flinders, Fostoria, Vada L. Driggs, Fostoria, Debbie S. (Bryan) Perfetti, Florida and Tammy J. (Brian) Makara, Cloverdale; 13 grandchildren, Lee (Kelly) Flinders-Senior Chief Petty Officer (Retired), Greg Flinders, John Flinders, Adam (Stacy) Flinders, Bryon Flinders, Kara Handshoe, Amanda Beattie, Jake Flinders, Will (Amanda) Frisch, Scott (Amber) Frisch, Anjum (Ralph) Reid, Kyle Perfetti and Alexandra Perfetti; 12 great-grandchildren, Morrigan, and Gabriel Flinders, Myah, Morgan and Ethan Handshoe, Rowen and Parker Beattie, Alyssia Flinders, Brayden, Austin, Kendra and Lane Frisch; and a sister, Midge Stephens of Kentucky. She was also preceded in death by a son, Harry L. Flinders Sr.; son in law, David A. Driggs; four brothers, Willard, Dennis, William and Cecil Jordan; and seven sisters, Inez Kennedy Hardy, Aileen Burris, Katheryn Meadows, Martha Cushard, Brenda Surgener, Ella Mae Preston and Mattie Davis. Betty was a homemaker. She also had worked for St. Catherine’s Manor of Fostoria and provided home care to elderly residents of the Fostoria area. 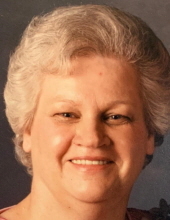 She was a longtime member of the former Assembly of God Church, Fostoria and former member of the Moose and Eagles auxiliaries. Visitation is Tuesday November 6, 2018 from 2-4 & 6-8 pm at HOENING FUNERAL HOME 242 W. Tiffin St., Fostoria. Funeral services will be held at 11 am Wednesday at the funeral home with burial following in Fountain Cemetery, Fostoria. Memorials are suggested to a charity of the donors choice. To send flowers or a remembrance gift to the family of Betty L. Flinders, please visit our Tribute Store. "Email Address" would like to share the life celebration of Betty L. Flinders. Click on the "link" to go to share a favorite memory or leave a condolence message for the family.